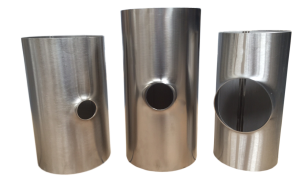 Available to order in grade 304 & 316 stainless steel. Can be produced from Descaled or Brushed tube. Produced by Berkeley Stainless, using T-Drill. Generally made to order – Short lead-time. Tees are produced “as pulled” – dimension H is given as a guide only & may vary.